Thanks to Laura at Writing the World For Kids for hosting the Poetry Friday Roundup today. If you’d like to know more about Poetry Friday, click HERE for an explanation by Renee LaTulippe. From Rosie: May your candy joy never end and may you always have enough to share because that’s the sweetest part of all! Meet Alina: Alina is a 5th grader in a gifted and talented school. She has a sweet tooth, likes music, art and loves gymnastics. Alina is also a big supporter of her mom’s writing and is always ready to help with feedback and advice. Meet Rosie: Rosie J. Pova is a children’s author, poet, wife, and mother of three. Originally from Bulgaria, she now lives in Texas with her family. Rosie loves candy, but more than that, she loves to inspire children to dream big and follow their passions. No matter what kind of story she writes – funny, sweet or silly– she hopes to move her readers and warm their hearts. 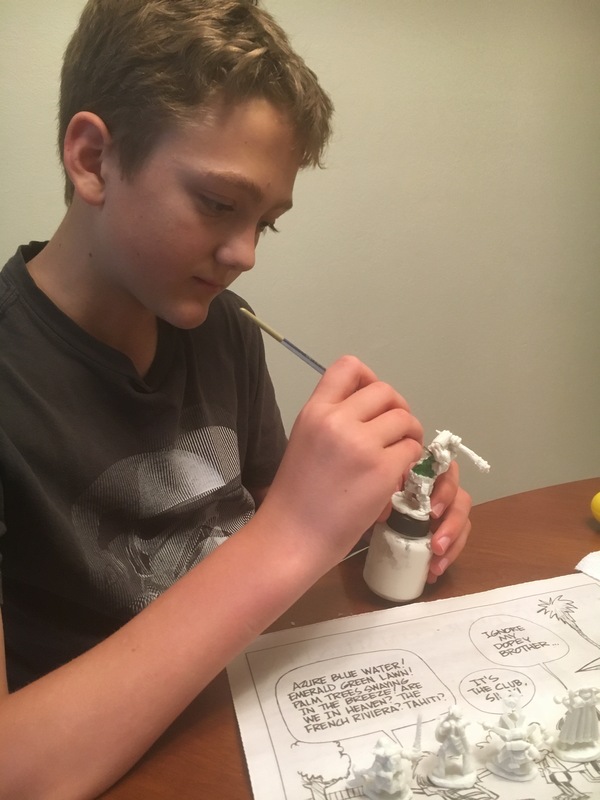 Cap’n Rex & His Clever Crew: A Piratey Post With Author Henry Herz + GIVEAWAY! I beg of ye to tell me . . . what be more fun than dinosaur pirates? Nothing I tell ye! Nothing! So if ye care to have fun then lend an ear. Henry Herz be having a new tale! CAP’N REX & HIS CLEVER CREW just be released on August 1st! Ye must sail on down to yer local bookstore or yer library and nab a copy! It be a treasure! From Kirkus Reviews: The dinosaurs may be extinct but let’s hope dinosaur pirates keep on sailing for arr-ternity. I be thinkin’ ye have questions about how such a tale came to be. Well jump aboard cuz I be askin’ Henry just that! And he be answerin’. Me: Ahoy there, Henry. I see ye’ve written a clever tale o’ dinosaurs and pirates. How in the seven seas did ye come up with such an idea? Henry Herz: I thought it would be fun to do a mashup – a combination of unlikely elements. In fact, my original title was DINOSAUR SPACE PIRATES! But it became clear as I worked on the manuscript that mashing up three ideas was one idea too many. Kids love dinosaurs, and they love pirates. So, they must REALLY love a book featuring dinosaur pirates, right? I also wanted to do a book with the theme of thinking outside the box. Captain Rex and his dinosaur pirates sail the seven seas in search of buried treasure. But whenever they hit an obstacle—like a giant shark or pea-soup fog—the crew members are quick to say they can’t overcome. To this, Captain Rex always glares with teeth bared and says, “CAN’T YE?” And, somehow, the crew always comes up with a clever solution. Being clever is always preferable to being eaten, I always say. Henry Herz: Great question. And it reminds me of the terrific saying: “Smooth seas do not make skillful sailors.” That’s certainly true for writing. I checked my computer to see how many versions of the manuscript I wrote. 27. That said, a score of revisions is not that uncommon (for me, at least) for perfecting a picture book. Certainly, my editor at Sterling was a pleasure to work with – no rough seas there. Me: Blimy! Ye had to be bloody bullheaded to tell yer tale. Seems there be no hornswagglin’ nor dabloon-bribin’ bookmakers into publishin’ yer tale. And since there be no hornswagglin’ do ye have a bit of advice for other mateys who be wantin’ to their tales to be books like yers? Be a honey badger. Have no fear. Don’t be scared to put words to paper. Don’t flee from constructive criticism. Don’t be afraid of rejection. They all line the path to traditional publication. Honey badger don’t care, and neither should you! Get outside your comfort zone. Be a dung beetle. Be tenacious, even on crappy days. Becoming published isn’t easy. But it won’t happen if you stop trying. The journey of a thousand miles begins with a one step. Revise, revise, revise. But remember that perfect can be the enemy of good enough. At some point, you need to submit! Be an armadillo. You need to be thick-skinned and learn to roll with the punches. Understand that a publisher’s or agent’s rejection isn’t personal, but it is highly subjective. Many great works of literature were rejected repeatedly before being published, so you’re in good company. Be an ant. No man is an island, and no ant is a bridge. Teamwork is your best friend. Take advantage of critique groups to hone your craft. Join the Society of Children’s Book Writers and Illustrators to develop a support network. Leverage social media to connect with fellow writers. You’re not alone. Be a hagfish. Be flexible enough to incorporate helpful feedback. But feel free to ignore feedback that doesn’t resonate with your gut. Follow the rules, but recognize that they can be broken when the result is a success. 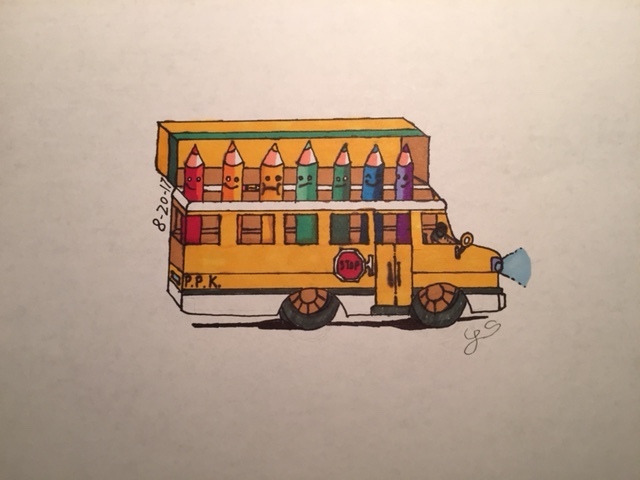 Drew Daywalt’s The Day the Crayons Quit is a picture book with over 1,000 words and inanimate characters. But it’s also a New York Times bestseller. Me: Ye not only be clever . . . ye also be wise. Speaking of clever and wise I be thinking ye must have other tales that be sailin’ into bookstores in the future? Will ye share a bit if ye have such tales? TOP OF THE HEAP – Barnyard animals debate who is the best animal on the farm. Each makes their claim, even Dung Beetle. In response to the others’ laughter, Dung Beetle takes a vacation. Eventually, they all recognize even tiny Dung Beetle’s important contribution. That’s how he rolls. NEVER FEED A YETI SPAGHETTI – Two young goblin siblings throw their mom a monstrous birthday party. Despite their best efforts, things go further and further awry, thanks to the yetis. One should never feed them spaghetti. ALLEN & ALIEN – Like many boys, Allen doesn’t like to eat his veggies, pick up his toys, or take baths. But he loves playing with his alien toys. When an indefatigably inquisitive alien drops in to study humans, the alien’s enthusiasm (even for the mundane) is infectious. Allen learns an important lesson about appreciating one’s blessings, while his parents are pleasantly surprised at their son’s new alien behavior. HOW THE SQUID GOT TWO LONG ARMS (Pelican Publishing) – Ever wonder why two of a squid’s ten arms are longer than the others? A selfish squid is cold, so he swipes other animals’ clothing. Will he learn it’s wrong to steal in the end? This modern fable demonstrates you reap what you sow. It’s Kipling’s HOW THE RHINOCEROS GOT HIS SKIN meets Klassen’s THIS IS NOT MY HAT. GOOD EGG & BAD APPLE (Schiffer Publishing) – Not all the foods in the refrigerator get along like peas in a pod. Bad Apple and Second Banana are at the root of the problem. The vegetables are steamed. Good Egg suggests his friends try different responses to the bullies, but his tactics don’t bear fruit, at first. Only by using his noodle does Good Egg save their bacon. ALICE’S MAGIC GARDEN (Familius) – Alice lives in the dreariest boarding school in England. She pours her love and attention into caring for her little garden and its denizens. Unknown to her, these include a large caterpillar, gryphon, and a talking white rabbit. When Alice is in trouble, the magical creatures come to her aid. Love, it turns out, is magical. GARDEN FAE is A SICK DAY FOR AMOS MCGEE meets ALICE IN WONDERLAND. Me: Well shiver me timbers! That be a slew of tales ye be sharing with the world! For more about Henry‘s books and blog interviews, see www.henryherz.com. Ahoy! There be treasure! Ye won’t need a treasure map. But ye must walk the plank and outsmart the sharks to win! Har! That be a pirate joke. All ye really have to do is leave yer comment below. Leave yer comment no later than midnight (CDT) Tuesday, October 3, 2017. A winner be randomly chosen. ***You must be in the United States to win. Details: Enter for a free chance to win an original signed painting by Benjamin Schipper, illustrator of the picture book, CAP’N REX & HIS CLEVER CREW, by Sterling Publishing. The painting of Kyle the Ankylosaurus pirate is roughly 8.5″ square, and was created with Holbien Acryla gouache and Prismacolor pencils on Arches Cold-pressed illustration board. It’s suitable for framing and mounting in any dinosaur pirate-loving kid’s room. Thanks to Henry for sharing with us today and huge congratulations on CAP’N REX & HIS CLEVER CREW! Meet Henry: Henry Herz writes fantasy and science fiction for children. He and his sons wrote MONSTER GOOSE NURSERY RHYMES (Pelican, 2015), WHEN YOU GIVE AN IMP A PENNY (Pelican, 2016), MABEL AND THE QUEEN OF DREAMS (Schiffer, 2016), LITTLE RED CUTTLEFISH (Pelican, 2016), CAP’N REX & HIS CLEVER CREW (Sterling, 2017), GOOD EGG & BAD APPLE (Schiffer, 2018), HOW THE SQUID GOT TWO LONG ARMS (Pelican, 2018), and ALICE’S MAGIC GARDEN (Familius, 2018). Happy Book Birthday to Matt Forrest Esenwine and Flashlight Night! Congratulations on your debut picture book, Flashlight Night! I read hundreds of picture books every year and Flashlight Night is one of my favorite reads. Not just one of my favorite reads of the year, but one of my favorite reads of all time. It’s a magical book and as soon as I finished the last page, I flipped back to the front to read it again. There is so much to take in between the words and the art. I think the blurb on the book jacket may sum up what I’m trying to say. It’s obvious from the reviews that I’m not the only one who felt the magic. I imagine those of you reading this post can’t wait to open the pages of this book and experience the magic for yourselves. Once you’ve experienced it, you may be curious like I was. Where did this magical book start? What sparked the idea? Guess what? I have someone “in the know” here today! Lucky us! So Matt, I would love it if you’d share the inspiration for Flashlight Night and “shine a light” on your writing process, from idea to completed manuscript. Tell us how you captured MAGIC, WONDER, and ADVENTURE in just 32 pages. I have been asked by numerous folks about the inspiration for Flashlight Night , and I have yet to come up with what I feel is a decent answer. I know how the book came about – I’m just not sure why. It started off, simply, with me attending a local SCBWI (Society of Children’s Writers and Illustrators) event in Massachusetts. Back in August 2014, a number of local SCBWI members had gotten together at Kimball Farm in Westford, Mass. to hang out and chat over appetizers and drinks and as I was driving home, the idea of a flashlight “opening up the night” popped into my head. It was at least 10pm or so, and all I could see was what my headlights revealed…so I started thinking about what to do with the words in my head, and by the time I was home (and hour and a half later) I had the opening and closing stanzas pretty well nailed down. The following week, I continued working on it – still not sure if it was a stand-alone poem or a picture book manuscript – and had completed the first draft within just 6 or 7 days. By the time it was done, I knew it was a picture book, albeit a very poetically-written one. (Of course, I continued tweaking it over the course of the following 2 or 3 weeks, because I wanted it to be as polished as possible before sending it out to my editor, Rebecca Davis at Boyds Mills Press. As I write primarily poetry, I deliberately made use of alliteration and internal rhyme, unusual end rhymes, and fun words that would not only lend themselves to fleshing out the story and imagery, but would perhaps stretch a young person’s vocabulary. The word ‘flashlight’ is used only once, as the very first word. There is no mention of any other characters – boys, girls, animals, names. The main subject of the book (the flashlight) is inanimate. Imagery was abundant, but often ambiguous. The story arc does not follow any sort of formula, other than there is a loose narrative. Knowing there was a lot of imagery in this manuscript, I tried to keep specific details out of the story, so an illustrator could have ample room to share in telling the tale. For example, in one scene I make reference to a “peculiar door” – and that’s all I say about it. I figured, I’d let the illustrator determine why it’s peculiar! Speaking of Fred, I can’t thank him enough for taking on this manuscript. He told me loved the classic feel of the text so much that he wanted to create a classic look to the illustrations – so this is his very first manuscript using traditional media. He drew all the illustrations by hand, inked them in, then scanned them into his computer to colorize them. Thank you for taking the time to share your process, Matt. It was very interesting and the attention you gave to Flashlight Night makes me love it even more! ***Goodreads giveaway! You could win one of TWENTY COPIES of Flashlight Night. Starting at midnight 12:00 am PT, TODAY, Tuesday, September 19 (publication day) you can enter! The contest will wrap up at 11:59 pm PT on Tuesday, Sept. 26. To learn more about Flashlight Night be sure to check out the stops on Matt’s blog tour. Meet Matt: Over the years, Matt Forrest Esenwine has had several adult poems published in literary journals and magazines around the country, and in 2012 his poem, “Apple-Stealing,” was nominated by the Young Adult Review Network (YARN) for a Pushcart Prize. Meanwhile, his children’s poetry can be found in numerous anthologies including J. Patrick Lewis’ The National Geographic Book of Nature Poetry (National Geographic Children’s Books, 2015), Kenn Nesbitt’s One Minute till Bedtime (Little, Brown Books for Young Readers, 2016), and Lee Bennett Hopkins’ School People (Boyds Mills Press, 2018), as well as “Highlights for Kids” magazine. His picture books include Flashlight Night (Boyds Mills Press, 2017) and Don’t Ask a Dinosaur (Pow! Kids Books, 2018, co-authored with Deb Bruss). Thanks to Michelle at Today’s Little Ditty for hosting the Poetry Friday Roundup today. 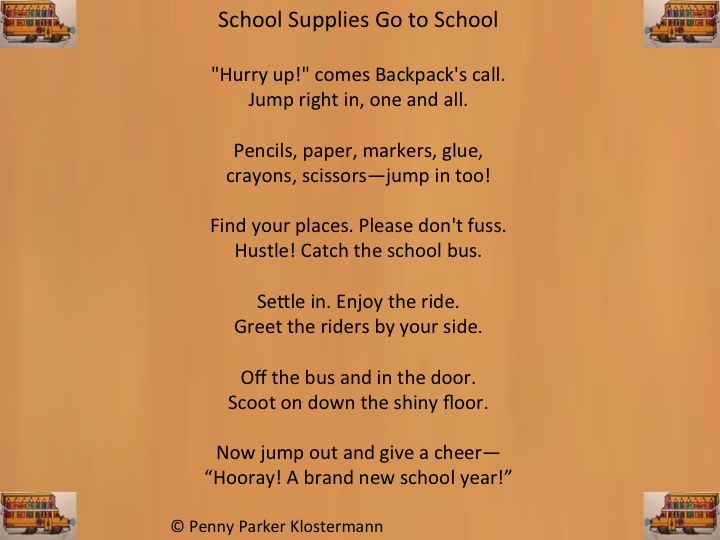 If you’d like to know more about Poetry Friday, click HERE for an explanation by Renee LaTulippe. From Tim: I loved playing Dungeons & Dragons when I was a kid. The magic! The monsters! The 20-sided dice! It’s the ultimate role-playing game that’s all about storytelling and using your imagination. But another aspect of the game I loved were the detailed miniatures I painted and played with during campaigns with my friends. 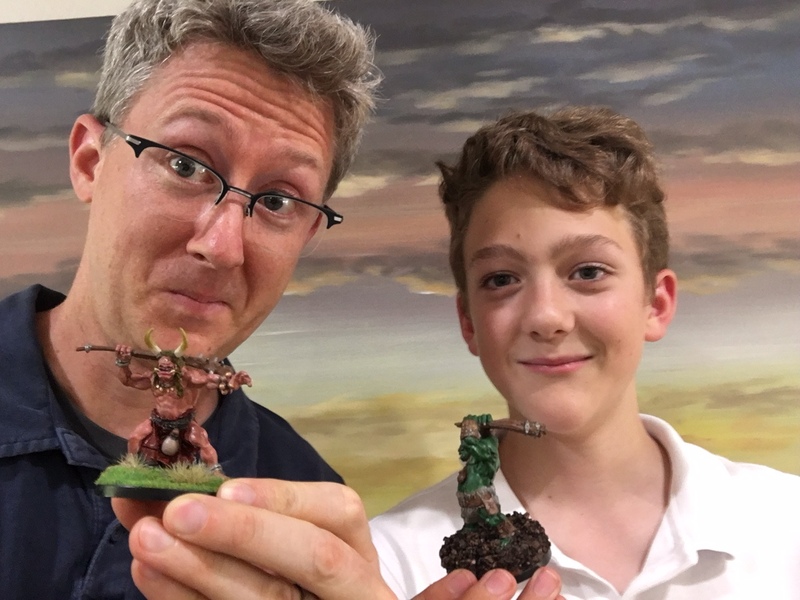 I’ve passed on my love of D&D to my 12-year old son, Nate, and besides playing the game, we have a lot of fun sitting down and painting minis together. I’m no illustrator—I’m a words & music man by trade—but I get great satisfaction from choosing my colors and bringing these creatures to life with tiny, fine-tipped brushes. 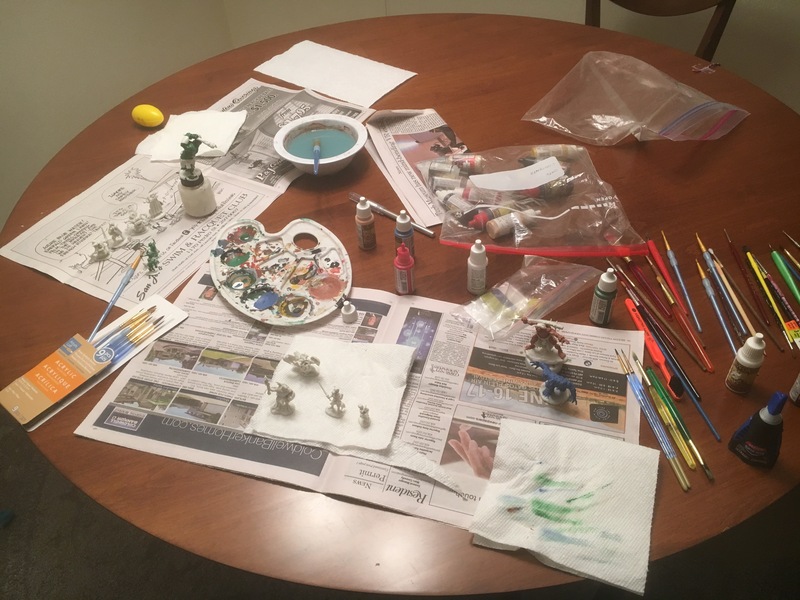 Each mini is like a blank canvas, and when we’re done, the characters beg to have their stories told. 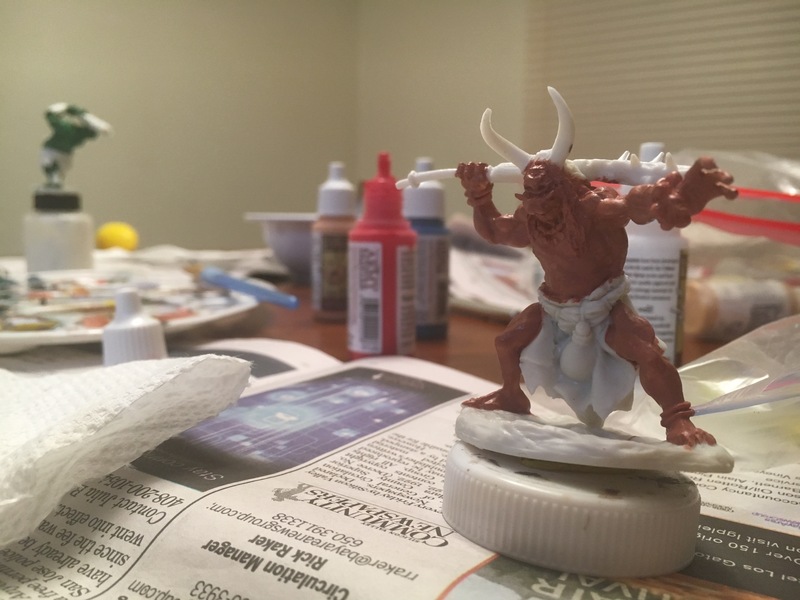 Nate and I recently painted two new minis for our collection. 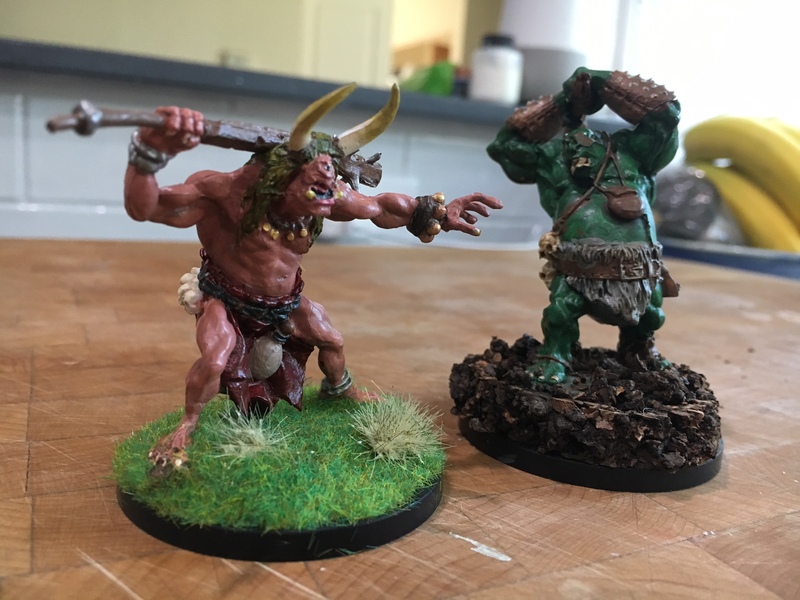 His is a fierce cave troll, and mine is a gruesome ogre with horns. Once the paint was dry, I wrote a poem for our miniature monsters and Nate provided an illustration. 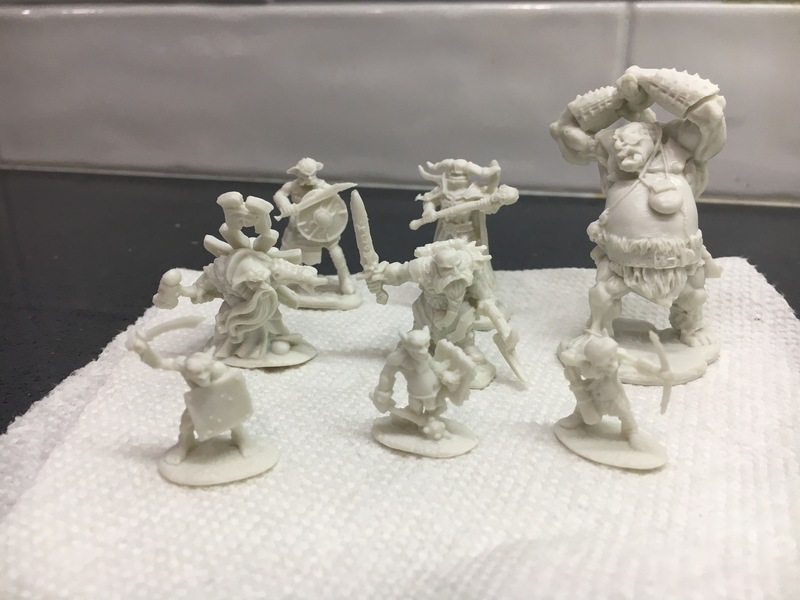 Swing by your local game shop to learn more about miniatures and roll-playing games! Many thanks to Tim and Nate for sharing their talents with us today! Meet Tim: Tim McCanna is the author of Bitty Bot, Barnyard Boogie, Teeny Tiny Trucks, and Watersong, which received a star from Kirkus Reviews. His upcoming picture books include Jack B. Ninja, Bitty Bot’s Big Beach Getaway, and Boing! Tim serves as Assistant Regional Advisor for SCBWI’s San Francisco/South chapter, and he enjoys going on woodsy hikes with his wife, two kids, and their dog Millie. Find Tim online at www.timmccanna.com. Winner of Marsha Diane Arnold’s Baby Animals Take a Bath!!! Marsha Diane Arnold joined me on my blog on September 1st to collaborate with her four-year-old granddaughter Gráinne. It was a delightful collaboration featuring poetry and art! If you missed their collaboration, you can see it HERE. Not only did readers get to enjoy the collaboration but they also had a chance to win a signed copy of Marsha’s newest board book, Baby Animals Take a Bath. All they had to do was leave a comment on the blog post by midnight September 8th to be in the drawing. Thanks to Kat hosting the Poetry Friday Roundup today. If you’d like to know more about Poetry Friday, click HERE for an explanation by Renee LaTulippe. **GIVEAWAY! Before you view today’s collaboration I wanted to let you know that Marsha has generously offered a signed copy of her newest board book, Baby Animals Take a Bath, with delightful illustrations by Phyllis Tildes. Many are giving this book with a hooded towel and bath toy for baby showers. About the Story: From a polar bear rolling in the snow to a zebra in the dust, animals in various settings enjoy their special kind of bath, ending with a human baby having fun in a bubble bath. Little ones will discover some new animals and understand that all animals, including humans, have important things in common. **Those who enter must have a US address. All you have to do is leave a comment below by September 8th at midnight CST. A winner will be randomly selected. From Marsha: My granddaughter Gráinne recently turned four. Her favorite things to draw are faces, the sun, and trees. She has always been enchanted by the wind. So, I wrote a simple poem about the wind and dancing with leaves for our collaboration. After Gráinne made a few drawings of herself dancing with the leaves, she declared she wanted to go outside to talk to a tree. She stood in front of our big oak for a few moments having a conversation, then danced with the oak. I love that our collaboration of poem and drawing also took her outside for some real dancing and to commune with nature. Thank you, Gráinne, for sharing your creativity and your enthusiasm. Many thanks to Marsha and Gráinne for sharing their talents with us today. Meet Marsha: Marsha Diane Arnold is a multi-award winning picture book author whose books have sold over 1 million copies. The media has called her, “a born storyteller.” Recent books are Waiting for Snow and Junior Library Guild selection Lost. Found.. Three new picture books are scheduled for 2018.